You own or manage the business. You know that small and mid-sized business owners like yourself create 80% of all new jobs and accounts for 40% of our country's gross domestic product. Your company is staffed lean, focused on the core business and probably doesn't have the time resources or expertise on staff to support your business communications. You know, the basics... marketing, advertising and public relations but geared to small and mid-sized businesses like yours. The important activities that tell the world who you are, what you do and why you do it better than everyone else. As an astute business owner you understand the importance of outsourcing and what a valuable resource an outside partner can be. Your outsourced partner is there when you need them, ready to offer a new strategic idea or present a fresh point of view yet not part of your daily overhead. 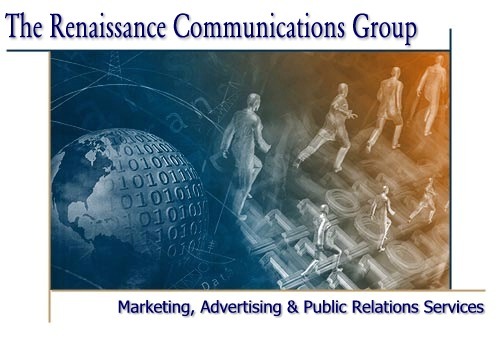 These are the reasons why you should contact The Renaissance Communications Group. We're a group of dedicated communication professionals more interested in growing your business than ours. We'll work to understand your needs and not just give you lip service. Our creed is "Brains, not Brawn" because we can produce results for you without spending a fortune. Most of all, we're a group you can trust. Turn to us for your marketing and promotional support when results mean more to you than the glamour and hype of a high rent agency.